Thirty-four years ago, this woman established an organization that would touch hundreds of thousands of lives in Pittsburgh and beyond. 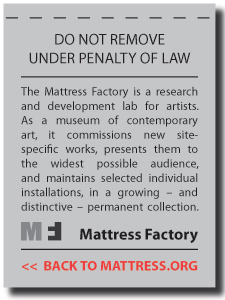 The Mattress Factory has welcomed installation artists from all over the world including Ann Hamilton, Damien Hirst, Jessica Stockholder, David Ellis, Yayoi Kusama, and more than 450 others. 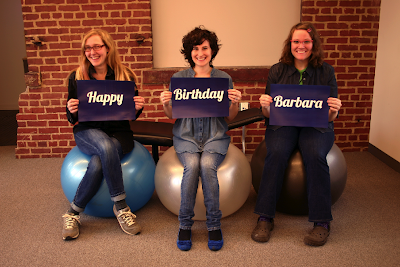 Today, staff wore double-denim (also known as the Canadian tuxedo) and sat on exercise balls – two things for which the Mattress Factory founder, Barbara Luderowski, is known – in honor of her birthday. Maybe next year we’ll shave our hair down to an inch in length. Maybe. Barbara, thank you for everything you’ve done and everything you do. Robert Farris Thompson is America’s most prominent scholar of African art and its influence on American and Caribbean art and music. In the preface to Thompson’s forthcoming book, Aesthetic of the Cool: Afro-Atlantic Art and Music, publisher Gloria Kury calls him a living legend, and based on what I’ve read, I’d say that description is right on target. He has published eight books on topics ranging from the art history of the Yoruba people of southwestern Nigeria (Black Gods and Kings, 1971) to the cultural history of the tango (Tango: The Art History of Love, 2005). The Master of Timothy Dwight College at Yale, Thompson also authored an introduction to the diaries of Keith Haring and studies the art of Jose Bedia and Guillermo Kuitca. He has been anthologized fifteen times and was given the 2007 “Outstanding Contribution to Dance Research” award by the Congress of Research in Dance. Long story short, this guy is brilliant. Which is why we are thrilled to announce that Thompson will be visiting the MF this February for a tour of Queloides and a discussion! Dr. Thompson will present The Edge of the Road is Listening: The Art and Origin of an Afro-Cuban God. He will also be speaking about his almost-at-the-printers book, Aesthetic of the Cool, which collects the best of the essays on Afro-Atlantic art and music that he wrote from 1963 to 2006. The evening is sure to be incredible; Gloria Kury recalls waiting outside one of Thompson’s classes at Yale and being bombarded by the sounds of music punctuated by thunderous applause. Not to mention my recent Internet search that yielded images of Thompson dancing the tango during several different lectures! The cost is $10, and as always, MF Members and Pitt and CMU students are free! Heading to the party? Here are some parking tips. 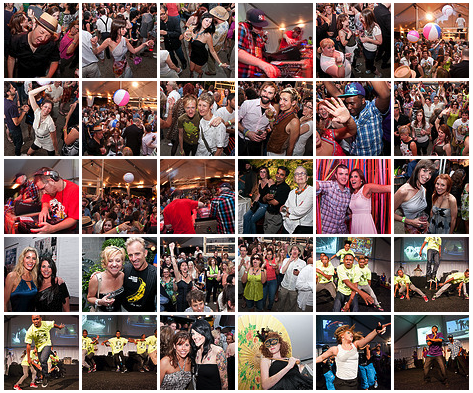 Save the date for the Mattress Factory Urban Garden Party: From Hollywood to Paradise -- chaired by Michael White and Rick LeBeau -- Friday, June 17th, 2011! The Urban Garden Party is the event of the summer you don't want to miss. 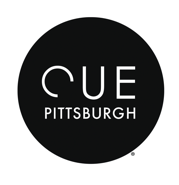 Last year, the event sold out and more than 1,000 attendees turned out to help support the museum's mission and celebrate this unique Pittsburgh institution. "...the Mattress Factory's Urban Garden Party is the type of gig that, if missed, will result in an eyebrow raised ever so slightly in an oh-so-you-weren't-there? sympathetic sort of condolence." Still not convinced you should come? Check out these photos from last year's party!